And here it is. Please help us spread the word! Action House Heidelberg is collaborative working space for creatively and artistically-minded people (and those who would like to be). We want to support young artists and entrepreneurs as they shape the face of the community. In addition to offering creative space, we offer training courses, workshops, seminars and so on in various creative areas, including fashion design, video production, language training, music, and graphic design, among others. So if you want to expand your kreativität, we’re just what you’re looking for. 1. Interact with us. Like, Tweet, or share our forward entries to all of your friends (and we also welcome your comments)! 2. Get automatic updates through RSS to your favorite feed reader! 3. 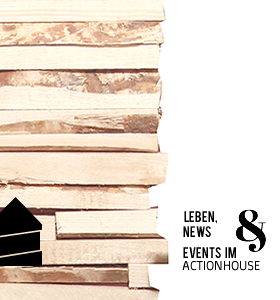 Follow us on Twitter (@ActionHouseHD)! 4. Become a fan of our Facebook Page! 5. Subscribe to our YouTube Channel! If you’re REALLY on fire to help us out, and especially if you live near Heidelberg, Germany, let us know and we’ll be glad to arrange something! Stay awesome, and Keep a lookout for more to come! And just for good measure, here’s one final EXCLAMATION POINT!